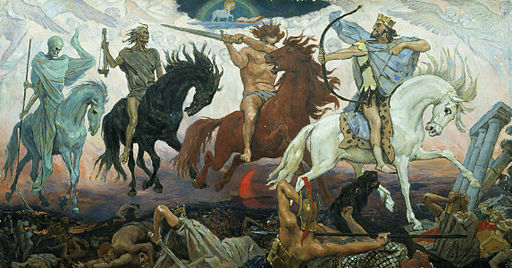 The Four Horsemen doing what they do best! Is our planet screwed? Are we going to run our civilization into the ground, as many doomsayers claim? When you look at the cold figures science provides us, they are certainly terrifying. The combined forces of climate change, global resource depletion and population growth guarantee that we’re in for some major upheavals in the near future and it’s a moot point as to whether our societies and their institutions are resilient enough to weather this. Still, we may just pull through before things get catastrophic. To do this, we will have to pivot rapidly and change the way we use and share resources around the world. And here, we can only rely on ourselves to get this done. Salvation will not come, if it does come, from governments and the world’s top decision makers. They’ve been aware of the social and environmental limits we are approaching for decades but have failed to make the bold choices that are called for. Nor will it come from a technological ‘silver bullet’, such as cold fusion or any other green innovation that promises cheap, clean and abundant energy overnight. These hopes have come and gone and they have always turned out to be neither cheap, nor abundant and certainly not ready to roll out in short amount of time we have left. No, it seems unlikely that old hierarchical powers or miraculous innovations will deliver the kind of rapid social and policy change we need. If anything might, it would be the powerful citizen movements that have been rising from the ground up these past fifteen odd years. These are the forces that brought us the Arab Spring, Occupy Wall Street and the 400 000 people hitting the streets of New York for the recent People’s Climate March. All of these movements drew their power from the new synergies of activist organizing in real space augmented by the power of online social networks to recruit, mobilize and amplify their actions like never before. Beyond these high profile flashpoints, there are hundreds of stories of advocates now scoring victories across the world thanks to this new set of tactical advantages. These include resource sector showdowns, the triumph of human rights in repressive regimes and various campaigns to fight oppression in rich and poor countries alike. Taking a wider view, this also includes the networks of entrepreneurs and wired consumers who are collectively disrupting the economy and creating large-scale sharing systems that are rapidly gaining ground. In short, social networks and their technologies, hacked and adapted for the use of social movements, give us the special powers we will need to push change through. More importantly, they stand a chance of making things happen at the speed required given the crises we are facing. In the short term, citizen movements must use the strength of social network movements to force governments and business to address our concerns. In the longer term, we need to build new collaborative structures and codes of conduct to get better at collective resource management and collective decision making. There is clearly a lot that needs to be understood and a lot of work to be done in the coming years. But, considering the stakes, no one can say it will not be worth a try! Stay tuned… more to come soon! Have some thoughts or ideas to contribute to this book? Don’t be shy! Contact me here.